What happens when buildings get too hot? Imagine the sun beating down on a hot, humid July day in New York City. Or Atlanta. Or Portland. Or Minneapolis. 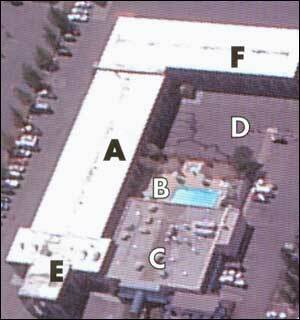 If the temperature on the sidewalk is 95°F, the temperature on a black rooftop can soar to more than 140°F. As the surrounding air gets hotter, rooftop air conditioners have to work harder to cool buildings. Energy use goes up all over the city. As demand for energy increases, the cost of energy goes up and shortages result. More power plants must be built. As more energy is consumed, our dependence on foriegn oil grows. In the meantime, escalating urban temperature contribute to increased pollution and environmental degradation. And in the long run, nothing impacts a building envelope's integrity more severely than relentless exposure to the sun. What makes Duro-Last Cool Zone the World's Coolest Roof? Before you make a decision about cool roofing, you'll want to ask yourself - how can I be sure my investment will pay off? With a Duro-Last Cool Zone Roofing system, the pay-off includes immediate energy savings and potential evergy rebates, along with the assurance that you have installed an energy efficient roof that will protect your building and its occupants for years to come. We start with higher reflectivity - and maintain it long-term. The superior, long-lasting reflectivity of a Duro-Last Cool Zone roofing system starts with proprietary thermoplastic PVC film, Our formulation produces a membrane that is white through and through, to provide the longest lasting high reflectivity of any single-ply membrane. 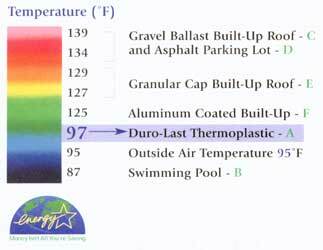 In fact, a Duro-Last Cool Zone roofing system loses only 1% of reflectivity after three years of weathering. This high, sustained reflectivity is saving significant energy and money for building owners all over the U.S. The Duro-Last membrane is classified as a co-polymer alloy and is a proprietary thermoplastic formulation consisting of resins and plasticizers, stabilizers, biocides, flame retardants and U.V. absorbents. This membrane is then laminated to a weft insertion knitted scrim. The Duro-Last membrane is available in white, tan or gray. Duro-Last uses custom prefabrication to provide quality-assured products by producing 80-85% of the seaming in a controlled environment. The architect, specifier, consultant, contractor, building owner and the manufacturer have peace-of-mind knowing that only 15-20% of the seaming is done in the field. Every project is pre-engineered and designed to address the specific needs of each individual roofing application. Prefabrication reduces material waste associated with roll goods systems. Additionally, the Duro-Last (white) membrane can reflect up to 86% of the sun's ultraviolet rays. This in turn, can save money on energy costs. Duro-Last produces a complete line of standard and custom prefabricated accessories. These accessories incorporate the same membrane as the roofing sheets, and are made in the factory rather than labor intensive field fabrication on the roof. Standard accessories include:round pipe flashings, inside and outside corners, 2-way roof vents, roof drain filters, drip edges, gravel stops, termination bars and fascia with covers and clips. After Duro-Last roof sections and accessories are installed, the completed roof becomes one integrated system. Like a finely engineered machine, the Duro-Last Roofing System components work together to provide long-term watertight performance and protection. Hot air welding is used to bond all of Duro-Last's field seams, The welds can be made with either a hand-held unit or a walker welder. Heat welding eliminates the need for chemicals, torches and other unsafe non-manageable seaming systems. Duro-Last's product properties combined with heat seaming create a bond that is stronger than the individual products alone. The Duro-Last Roofing System is non-curing to provide excellent welding ability for the entire life of the system. A patch, curb, stack or any other necessary alterations can easily be accomplished by heat welding the new Duro-Last membrane or accessory to the existing membrane. Once installed, the Duro-Last Roofing System is continually watertight and virtually maintenance-free. The Duro-Last Roofing System is quick and easy to install. 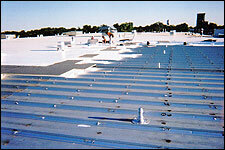 This roofing system can be installed by an authorized contractor right over most new or exciting substrates. The need for costly tear-offs and disposal can oftentimes be eliminated. 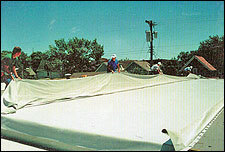 Slipsheets are required in some re-roofing applications. Most insulations have been approved for use with the Duro-Last Roofing System. Are you ready to take it cool? The Duro-Last Cool Zone roofing system is a proven products, backed by a nationwide customer service network. 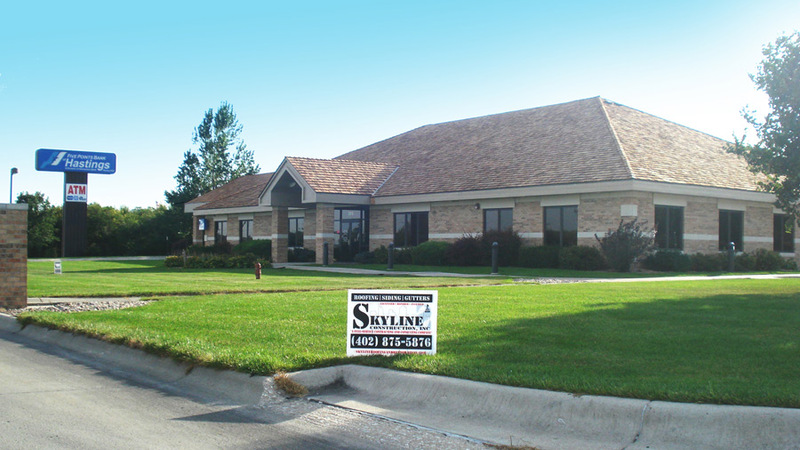 We're committed to delivering the information and support you need in order to get a leak-proof, reflective roof. If you'd like answers to any of the following questions, just contact us. We'd be happy to help. How much energy could a Duro-Last Cool Zone roofing system save in my building(s)? Can you provide a free inspection and evaluation of my current roof? What does Duro-Last Cool Zone roofing system membrane look like? Can I get an sample? 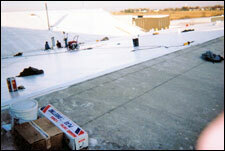 What types of buildings in my state are benefiting from a Duro-Last Cool Zone roofing system? 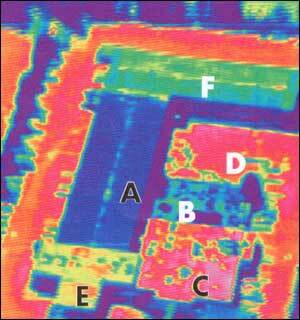 Is your Roof Hotter Than Your Parking Lot? 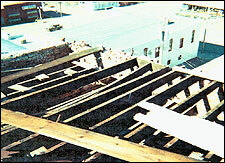 August 2, 2001 - 2:30 p.m.
"We have realized a substantial energy savings by using the Duro-Last Roofing System. In addition to recieving $3,000 in energy rebates, there was no distruption to our business during installation..."